We found a castle. It sits on a private comunity lake with other homes on the lake, but this castle sits all by itself at one end I believe it is on KELLY LAKE the name of the castle is unknown ,but one local told us that a woman whom lived there was murdered and it's sat vacant since then. I cannot confirm this but did hear this from more than one person.you can't drive to the house because it has a driveway that is so long you can't even see the house from the start of it's gated entry. If you can find anymore info on this house please let me know,the house is on Kelly lake in Watsonville, Cal. thats between SANTACRUZ AND MONTEREY. This picture was taken with a VERY hi powered camera from across the lake,it looks like we were close but without the hi powered lense we could hardly see the details of the masonry work. I know where Kelly Lake is in Watsonville, Cal. What I did not know is that there is a castle on the lake ( I must not be very observant). Any how, it was a very visible. I think a person, like myself, that has no idea about the castle could have easily missed it. Especially if it is a foggy day. Which it was on the day I was hiking on the lake. My fiancé and I had to hike across three farms to view the castle. It takes a little effort to find the entrance of the castle, but it's not difficult. There is someone living there and the castle is very well kept up. The castle has many great qualities plus it has a very elaborate boat dock (it looks like the castle). I asked a friend of mine who lives in the Watsonville area and he said the castle exists and it is called Kett's Castle. It belongs to a family member of the Kett family. They are developers/landowners in the central California coast area. 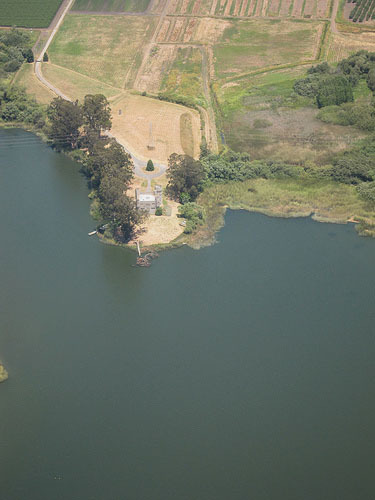 Just to let you know, I grew up in Watsonville, about a block away from the castle on Kelly Lake. The castle has always fascinated me. I heard several different stories about it over the years. One story is that the owner had each and every stone made and brought over seas from England. Another story is that the castle is equipped with many secret passages and revolving bookcases. There were still residents living in the castle back in 1984. I know this because, you are right, there is no access to the castle except by private road. I was 14 in 1984 and during a slumber party I was having, I got six of my friends excited and determined to see the castle up close. We trekked through mud, marsh, and barbed wire to get there, and get there we did. Amongst our trespasses we came across a large enclosure that contained a real mountain lion or bobcat of some sort. It was the most exciting day of my life. Anyway, you can get a better picture of the castle if you go to the end of Cutter Drive. Or you can come down the other side of the lake by taking Lake drive and turning on a private road that is the home of a rotary club or something like that. Neither of these roads provide access to the castle itself, the end of each road brings you to the edge of the lake, but close enough to get really great pictures. 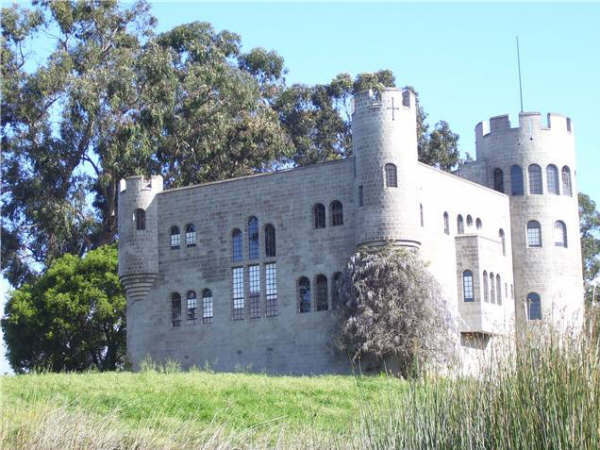 I just saw your picture of Kett's Castle, Watsonville on the web. I know the Kett family very well and no one was murdered in the castle! They did have a pet mountain lion at one stage. The castle is not made from stones from overseas it was all built on site. I have been in the castle many times and it is quite fascinating, it does have passageways and bookcases that spin around, suits of armour etc. It is a family home though so please respect the owner's privacy and do not encourage people to go hiking in there to look at it. My aunt was friends with someone who knew the people who live there, she saw the lion or bocat. She said it was big and it looked like a lion. I wish they would let the people of watsonville take a tour, I would even pay, it looks so beautiful from across the lake. My Dad enjoyed speaking with Mr. Kett about the construction of the castle on Kelly Lake in Watsonville. My Dad was amazed at the cost of the electrical work. If my memory is correct I believe that only half way through the project the electrical wiring cost $75,000. When my small cousins visited us from out of town I had fun asking if they wanted to see a castle. When it was first constructed there were still several empty lots at the end of Cutter Drive and there was a good view of the castle. The castle was built as a replica of a medieval castle and also had a moat. Nobody was murdered in connection with the castle. The Kett family were evidently intrigued by medieval castles and built one for their home. 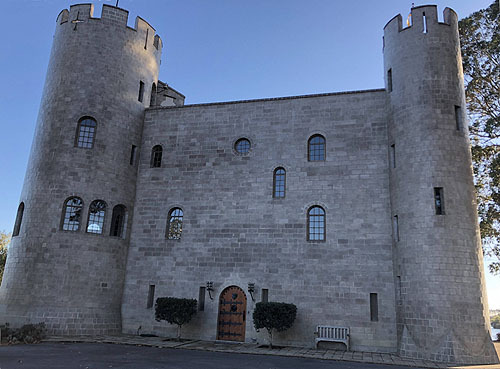 I think Mrs. Kett had a luncheon or some event and the local newspaper, the Register-Pajaronian covered the event and had photos of the interior of the castle and described the castle, but of course that was in the early 1970s so can't remember the details. The castle is quite intreging. I attended a halloween party there, it was quite fun. The next day, boat races were held in the "moat". The "castle" itself is constructed of cinder block not rocks, but has spires with stairways, etc. Very cool. I was bass fishing on a float tube in Kelly Lake and took some pic's. I live on the lake myself and my grandparents live there and have many stories about it. They watched the castle be built and were friends with Mr. Kett. Mr. kett was related to the Martanellis who still live on the lake today and own martinellis apple cider. A lot of your stories on your page are false a lot are somewhat true but parts and some are completely true. No one got murdered in the house!!! Mr. Kent did die on a boating accident and some of us like to scare our friends and tell them he died on the lake but that is not true, he died on a different one. The mountain lion is true the whole time my mom was growing up there was always a mountain lion there but today it is just a dummy. To this day there is someone in the castle. It's hard to tell who, but he loves to watch us barefoot water ski :-) He might be living there with a family or just taking care of the house. Whichever it is he is a nice man. First photo courtesy of Kraig Youmans. Second photo courtsy of Christian Williams.